As I have looked at the charts of other people who have been posting their results, I have never seen one that is this narrow or limited in ethnicity. What is more puzzling, though, is the fact that my dad's paternal line came from northern Switzerland and my mom's maternal line came from central Germany. Where are my European roots? 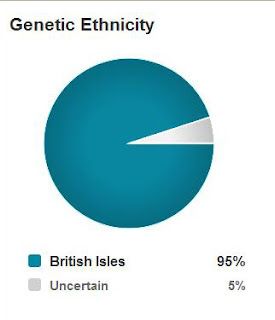 I was provided with a list of Ancestry.com members who purportedly match my DNA and also have British Isles ancestry. The next step is to go to their family trees to see if and where our families overlap. This weekend my sister and I went to Cincinnati to visit relatives. On Saturday I was able to interview two sisters who were my mom's first cousins. I had not really met them before so my mom's sisters Margie and Betty set up a lunch meeting with them. Their family lived with my great-grandparents after their father became ill and they lost their own home. (I think there is another story there.) As Michael J. Crusham was the first in the family to come over from Ireland, I was eager to hear what they had to say. Unfortunately their grandfather, Michael, died when they were still in grade school, so they had no idea why he left Ireland or who was on the ship with him. They did have some interesting stories to tell, and I shared some information with them that they hadn't known, so it was a good meeting. I was able to videotape an hour or so of it, until the battery on my camcorder died. It is kind of hard to be plugged in when you are at a restaurant. Because of side conversations I was not able to ask all of my questions, so I would like to meet up with them alone next time I go to Cincinnati. After we left the restaurant my sister and I headed off to a second cousin's house. He is the one that has the diary of a distant relative (second cousin, twice removed to me), and I had contacted him ahead of time to see if he would consider letting me bring the diary back to St. Louis and scan it on Jim's big scanning machine at the office. Then I would return the diary to him. He agreed, as I will give a scanned copy to him as well. I was just a little concerned that we might never get a copy from whatever institution he ends up giving this diary to in the end. I will be talking more about the diary on Write Formation. We got to see a number of other relatives as well on this trip, and had a lot of fun. Unfortunately all the visits took place around food since there really is no other place for us to meet. I always need to plan extra workouts after trips to Cincinnati! 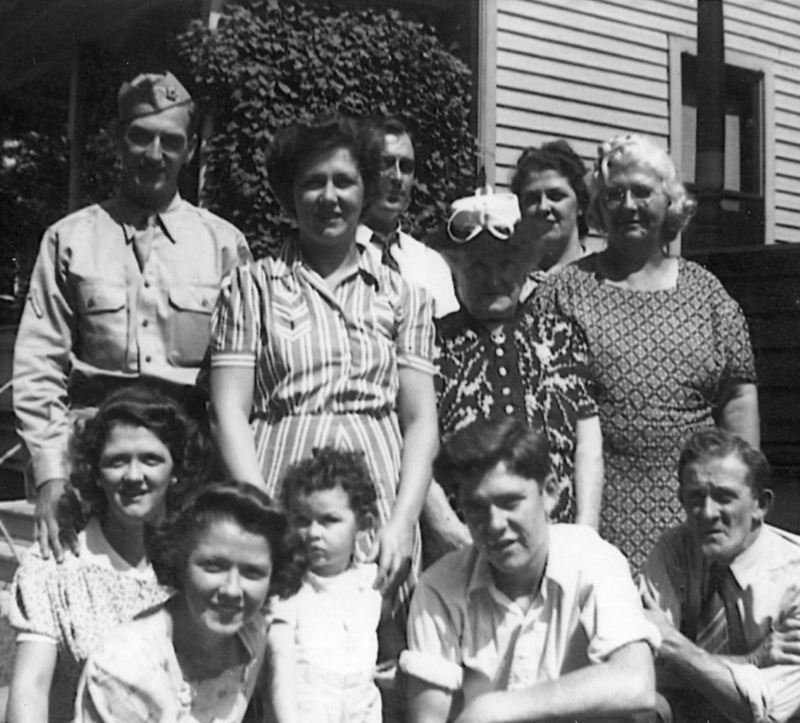 On my Write Formation blog I have been writing about the fact that I am participating in the February Family History Writing Challenge again this year. For last year's challenge I was writing about one of the branches on my mom's tree - the Crusham family. I would love to do a book about the family particularly since I have traveled to where they lived in Ireland, and I thought the challenge would give me the push I needed to get on with the project. I was able to keep up with the daily writing word count I had established for myself, but I realized there is still a lot I don't know about the family. So I have continued to research them and the towns they lived in. For this year's challenge I decided to write my own story, and it has been much easier to come up with things I want to say. I think I will probably just keep going with it once the challenge is done the end of February. Having said that, I am excited to be going over to Cincinnati this weekend with my sister. We always have a lot of fun visiting the relatives and eating unique Cincinnati food, but this weekend I will be pushing forward with my Crusham research. Two of my mom's first cousins, sisters in fact, are meeting my sister and me for lunch on Saturday. My mom's two remaining sisters will join us as well. These cousins, whom I have only met briefly at funerals, used to live with my great-grandparents when they were young. I am so eager to hear the stories they will have to tell! And I am hoping they won't mind if I videotape them as well, if that is possible at a restaurant. Maybe they know why great-grandpa's dad came over from Ireland all by himself when he was only about 18 years old. And why he picked Cincinnati as a place to live. If I am lucky I will be getting some great material to add to the Crusham Chronicles! There is a project that has been bouncing around the back of my mind for a few years, and I am ready to go forward with the idea. I obtained the domain names a few years ago and they have been dormant all this time. But after researching blogs for my presentation on Beyond the Blog: Tips for Turning Your Blog into a Book last fall, my eyes were opened to the types of weird and wacky blogs that were either a) being turned into books or b) being sold for huge amounts of money. I think this new blog idea can experience the success of the ones I had been reading about. I forgot how much decision-making takes place when establishing a new site. What platform do you want to be on? Blogger? Tumblr? WordPress, and if so WordPress.com or WordPress.org? What theme do you want? How about the graphics? So much to consider! I hired an illustrator to come up with a "character" for lack of a better word. We met on Monday and it was so fun to watch her draw up ideas on her tablet right in front of me. We came up with a pretty good sketch of what it will look like. She should have it officially drawn this weekend. Then I decided I want to have a special font for the name of the blog and the tag line that I will be using. So that meant an hour pouring over fonts and determining which one would look good with my "character".